Now this is something interesting, it is a trivet that is quite unlike any other, since it resembles that of a campfire. 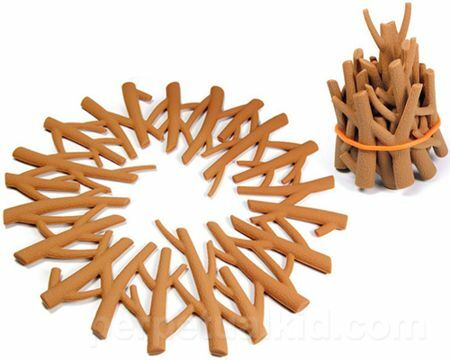 Yes sir, the $13.49 Campfire Trivet is an unnaturally cool looking thing to carry around, as while it resembles that of a pile of kindling, it is different from actual campfire. The whole idea of the Campfire Trivet is meant to cool down the pot that you place it on, and not to fan any flames! When not in use, it will be able to collapse into a small replica of a bunch of kindling. All that you need to do is to tie it up into a bunch thanks to the provided silicon band for easy storage.